Have you ever been unable to delete a file or folder because it was open in another program? Join the crowd. But you don’t have to be stuck and forced to reboot your computer to that file or folder gets released. The Windows Microsoft® ‘Resource Monitor’ be used to end a process currently holding on to a file (or folder) you are trying to delete. The steps below describe how to do it. 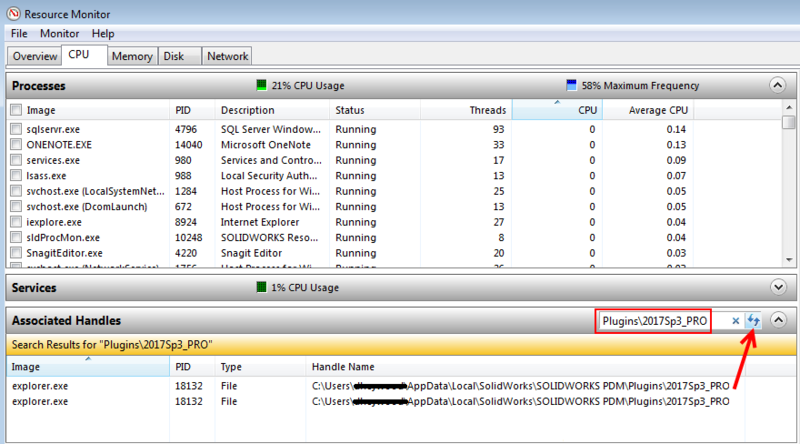 In the example, a folder (containing a temporarily cached SWPDM plugin) needs to be deleted in order to test the reload of the plugin file in SOLIDWORKS PDM. Make an attempt to delete the folder. You are asked for confirmation. When clicking ‘Yes’ on the above a dialog is displayed stating the delete action can’t be completed because the folder or file is open in another program. 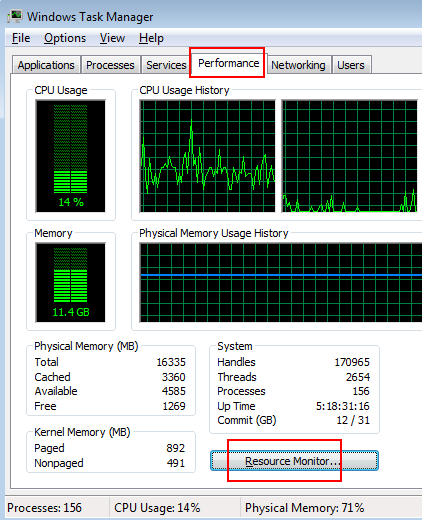 Once the ‘Resource Monitor’ is opened click on the ‘CPU’ tab. Once all Associated Handles have been stopped, it should be possible to delete the folder. The folder is now deleted. Mission accomplished. This service pack is now available to Subscription Service customers. To download, click here. Or log into the SolidWorks Customer Portal at https://customerportal.solidworks.com and click Download Software and Updates to access the update.SOLIDWORKS® 2017 SP4.1 replaces SOLIDWORKS® 2017 SP4 which is not available for download anymore. The following problem was identified with SOLIDWORKS® 2017 SP4:SPR 1039919 (Closing files in SOLIDWORKS 2017 SP4 with the SOLIDWORKS PDM Client add-in enabled may cause SOLIDWORKS to become unresponsive. )This problem does not exist in SOLIDWORKS 2017 SP3 or in older service packs of the SOLIDWORKS 2017 software. SPR#988107 – 3D Printing Print, Plot: 3D Printing button shows up in the print dialog but does not work when printing drawing on Windows 10 or 8. The hotfix for this issue is included in attachment of Solution Id: S-073341. This issue is fully addressed in SOLIDWORKS 2017 SP4. SOLIDWORKS 2018 Online Beta is here! We are delighted to offer SOLIDWORKS 2018 Online Beta. SOLIDWORKS Online Beta provides access to SOLIDWORKS 2018 Beta3 anywhere, anytime until the end of Beta, without the need to download, install, or activate. 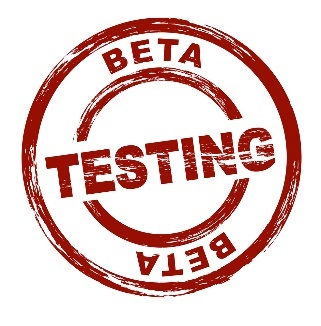 If you have any questions please email us at beta@solidworks.com. Last month, Brian discussed the topic of Correlating Simulation to Physical Tests. This month, Brian comes back to talk about Linear Static Productivity. Next month, Brian will discuss the topic of Shell strategies. Why does the SOLIDWORKS® 2017 SP4 software stop responding when I close files? An issue with the SOLIDWORKS® 2017 SP4 software may cause SOLIDWORKS to become unresponsive when closing documents with add-ins loaded, such as, the SOLIDWORKS PDM Client or possibly 3rd party add-ins. For a hotfix and other solutions, see Solution Id: S-073387. Is it possible to use a mobile device to access or manage a SOLIDWORKS® PDM vault? It is possible to use the browser on a mobile device to access or manage a SOLIDWORKS PDM vault. To do so, you must be able to establish a secure connection to the network that hosts the SOLIDWORK®S PDM Web2 application. 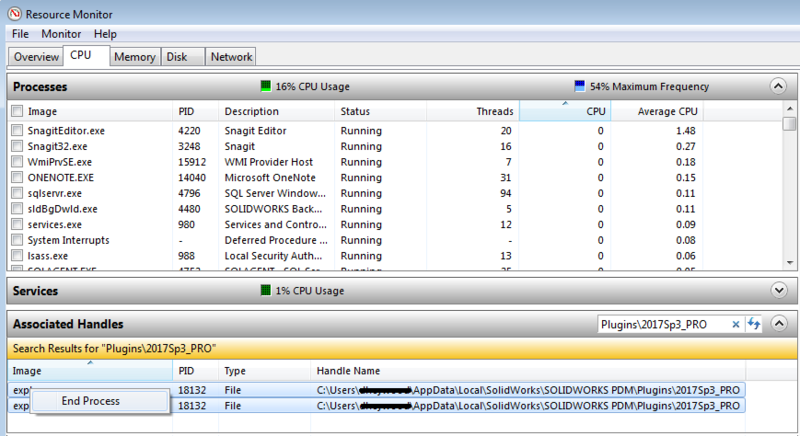 How do I configure the SOLIDWORKS® PDM Web2 application pool to use a local non-administrative Windows® user account for the application pool identity? The SOLIDWORKS® PDM Web2 application on Internet Information Services (IIS) will use the SOLIDWORKS PDM client Application Program Interface (API) to access file vault information. For the API to be able to access the file vault, the Web2 application pool must run under a Windows® user profile with sufficient access to the local registry and application data folder. For more, see Solution Id: S-073130. In a Motion Analysis study, how do I create a ‘Trace Path’ for the ‘Center of Mass’ of a component or assembly? It is not possible to create a ‘Trace Path’ for the ‘Center of Mass’ of an assembly or sub assembly. For information about an existing enhancement request for this functionality, see SPR 1029979. In SOLIDWORKS 2017, you can only create a ’Trace Path’ for the ‘Center of Mass’ of a component. To do so, see the example and follow the steps in Solution Id: S-072940. In a SOLIDWORKS® Flow Simulation animation with the NVIDIA® 375.63 or 376.84 graphics driver, how do I resolve slow performance or a crash that occurs following the NVIDIA OpenGL Driver message ‘A TDR has been detected’? This problem is due to instability in certain NVIDIA® graphics drivers during graphically intensive functions of SOLIDWORKS® Flow Simulation. 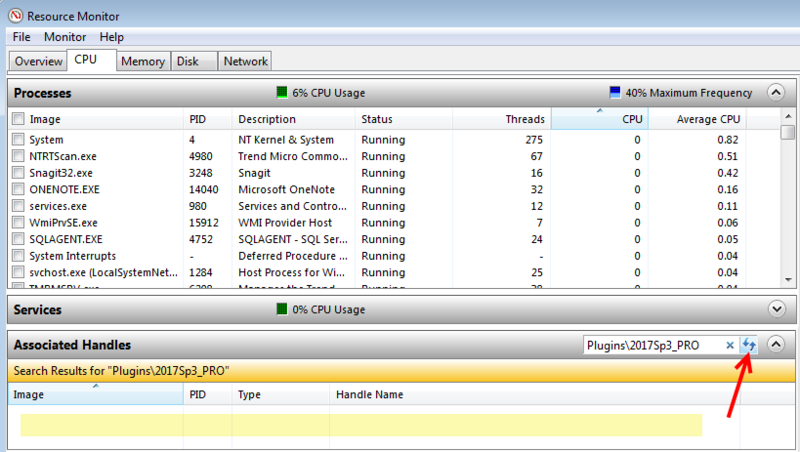 This issue is reported as SPR 1031804. To solve this problem, see Solution Id: S-073462.